Like I said, we'll be on this fountain pen ink theme for a few posts straight, folks. Bear with me. 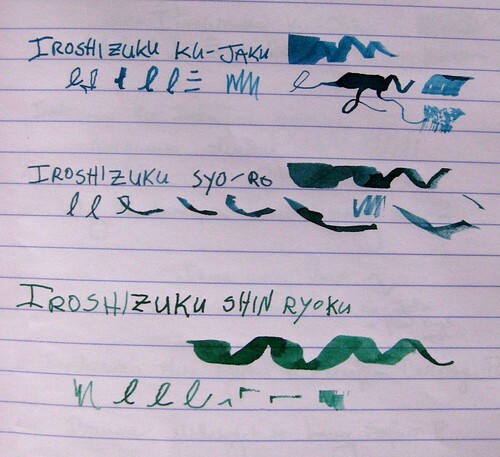 Here are three inks from the Pilot Iroshizuku series. It's a Japanese ink that is rather expensive... some folks think it's overpriced but I've found it's pretty darn fabulous. These are probably my three favorite inks right now. If you've heard me talk ink, you know I really love the fine lines between blue and green: the blue-greens, the green-blues, etc... and I love me a good, rich, dark green. So I am completely thrilled with these three. As with other ink photos, I've taken these in natural light from a variety of angles. Photographs do not do this ink justice - it has so much richness and depth, beautiful shading, and it really does look that gorgeous in a pen. I hope to have writing samples from a pen up here someday, but these are toothpick lines just like yesterday's post. I linked to the product pages because the bottles are so darn pretty, too. Even the boxes are gorgeous. Love the Pine Tree Dew color. It's got the best of the blues and greens and darkness. I'm going to attempt to mix something similar, right here in the kitchen sink! I'm sold! The "dries instantly" is the grab! I like the Shin-Ryoku very much. 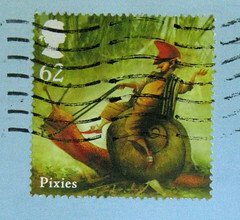 I received a letter from England penned in Tsuki-yo. As soon as I saw the ink color I looked to find a supplier in the US. I purchased mine from Jet Pens. The color and shading are great. Seeing the samples here I wonder where Tsuki-yo would fit in. I enjoy your ink comparisons. Lovely inks. I took the plunge the other day and ordered myself a bottle of the Yama-Budo. I am loving what it looks like in the bottle. I am just waiting for a pen to run dry so I can ink it up in a pen :D. I may have to check out some of the colors here. Great comparison! 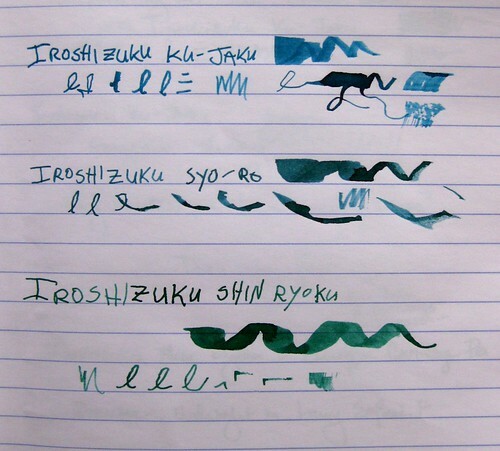 It is too bad that the brilliance of the iroshizuku line of inks doesn't show on the monitor. Sorry to disappoint everyone, but I do not intend to try the Yama-Budo. I've seen it in numerous letters, and while it's a lovely color, it is still too "pink" for me. I cannot abide magenta tones in a burgundy, and it has those in spades. 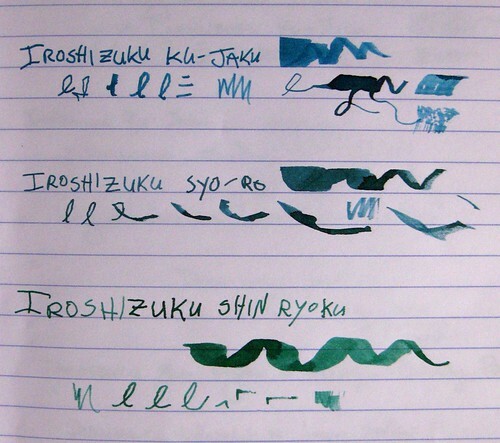 I may eat my words someday, but Yama-Budo is not currently on my Iroshizuku dream list. Oh man, those ARE expensive. They are quite pretty though! I really love the turquoise one the best. I bet they're going to be quite a pleasure to write with! I love the Shin-Ryoku. My favorite colors are green. More forrest colored than the blues. The flow of these inks in dry-writers is wonderful. Thankfully, JetPens came along. I was previously getting these inks from a seller in Maylasia and paying resaonable postage, but why pay postage when you can get more pens, pencils, or paper and pay no postage. Plus, they do deliver pretty darn quickly.